Big, green and mean just aren't going to have the same punch on the small screen. And punch is what this movie lacked in the first place. The bad news is, the big green guy is no Gollum. In computer-animating the not-quite-life-like title character of "The Hulk" from scratch -- instead of motion-capturing an actor who embodied the part as "Lord of the Rings: The Two Towers" did in creating its memorably alive CGI co-star -- F/X house Industrial Light and Magic isn't able to shake that herky-jerky signature look of a creature born of zeros and ones. The monster inside emotionally repressed scientist Bruce Banner (Eric Bana, "Black Hawk Down") that is unleashed by Gamma radiation has emerald eyes that lack depth and a mechanical way of blinking. When he runs, he looks like Fred Flintstone twinkle-toeing his lane approach at the blowing alley. When he's not in a rage, his body language is just a touch too mathematically smooth to seem real. And as actor Bana is morphed into the CGI Hulk, you can see the digital seams. The good news is, there's more to "The Hulk" than special effects, and as such the film eventually earns enough suspension of disbelief to accept the bulky computer creation as a full-blown character in spite of his rendering flaws. But unfortunately the picture has other shortcomings more elusive and fundamental -- mainly that while Bana does an admirable job of hinting at blistering emotions under the skin of a guy who shows only a stoic face to the world, "The Hulk" doesn't get to the heart of the man. And without the heart of Bruce Banner, the Hulk is just a hulk. Unique among larger-than-life comic book movies in that it's not precision-targeted at 13-year-old boys, the first hour of the film is a slow build of emotion over action. Chameleonic director Ang Lee (he of English period drama "Sense and Sensibility," Civil War epic "Ride With the Devil" and philosophical chop-socky "Crouching Tiger, Hidden Dragon") marries human drama with comic book styling surprisingly well in this first act and throughout the film. Most notably, he employs a creative editing style ripped straight from Marvel's pop-art pages. The screen often splits into framed sections, for example, to show multiple action or transition from one scene to another. Having unknowingly received his father's altered cell structure, when Bruce is exposed to Gamma radiation in a lab accident that would have killed a normal man, he soon finds he's just no longer himself when he gets angry. The first time he turns into The Hulk -- a green-skinned, ripped-muscle, indestructible colossus of mindlessly rampaging id -- it's upon his discovery of what his father did to him. 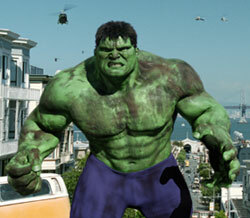 The Hulk tears apart Banner's laboratory, which results in the Army swooping in the next day to militarize the site. Soon the general (gravelly-gruff Sam Elliott) who once shut down his father's experiments is hunting Bruce as a threat to "national security." In the mean time, Betty Ross (Jennifer Connelly), Bruce's co-worker ex-girlfriend (and coincidentally the general's daughter) who gave up on their love over his lack of emotion, finds herself in danger from the volatile, single-minded Nolte -- who will stop at nothing to protect the experiment that is his son. When "The Hulk" reaches its two climaxes -- one action, one emotional -- ILM comes through with the best of its special effects. During a desert showdown between the Hulk and an army of tanks and helicopter gun ships, our computer-generated anti-hero looks close enough to photo-realistic that his tossing of tanks and his trademark half-mile leaps are exciting beyond any potential distractions from CGI-flaws. And when his subsequent rampage through San Francisco is halted by the sight of Betty, ILM conjures up recognizable heartbreak on the creature's face. Yet even in its most raucous action scenes and its truest moments of humanity (which are eventually abandoned for an over-the-top uber-finale), the movie fails to fully engage. Try as he might for both emotional truth and video-game thrills, Lee's comic-inspired visual techniques are ultimately more stimulating than anything in the story they help structure. When the credits roll on "The Hulk," the reaction from rabid fans and average moviegoers alike will most likely be a noncommittal shrug.